There’s a buzz in the office today as we look upon our new trophy which we received during Thursday night’s Growing Business Awards. As you can see from the photos, we got ourselves suited and booted and had a fantastic time meeting other entrepreneurial teams. The Growing Business Awards is a celebration of British enterprise, and includes awards such as digital champion, employer of the year, growing business of the year and retail hero. Sponsored by the CBI and Lloyd’s Bank, it was created by Real Business as way to recognise SME and entrepreneurial success. We were in good company within our category. Amongst the group was public transport crowdfunding company CommuterClub, online dress hire company Girl Meets Dress, ad-tech service Captify, cognitive learning technology company Celaton and storage service Kelly’s Storage. 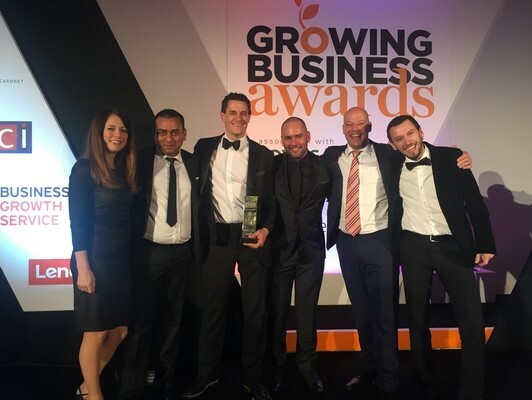 Scooping up the Growing Business of the Year: Smaller Company award was Zopa, the largest peer-to-peer finance company in the UK which has helped lend £1.18bn to 150,000 people since 2005. Winning the Mid-sized company award was Charlie Bingham’s, a pre-prepared food business which is stocked at Waitrose, Ocado and Sainsbury’s. Moving to the bigger end of the scale, the Growing Business of the Year: Larger Company was awarded to Tusker, a salary sacrifice car provider which helps organisations provide their employees with company cars at a low cost. Other category winners include Steve Jackson, who was credited as the Entrepreneur of the Year. Starting at 16 on his father’s scrap metal yard in Preston, he now runs Recycling Lives, a Queen’s Award-winning commercial recycling business which also helps vulnerable people work their way back to independent living. Picking up the Young Entrepreneur of the Year was Joe Fogel, founder of the VaioPak group which is made up of several print business and has clients such as Pret A Manger and Cadburys. We are very proud to be among such a high calibre of candidates and look forward to an exciting new year for our business.